Encephalitozoonosis cuniculi (E. cuniculi) is in the Fungi family, however it is a protozoa (single celled) parasite that infects many mammals. Predominantly, E. cuniculi causes disease in domestic rabbits. Rabbits become infected either through ingestion of spores from the urine of an infected rabbit, or trans-placental infection from the mother. Because of this, and the tendency for rabbits to live in close proximity to other rabbits for some portion of their lives, anywhere from 50-95% of rabbits will test positive for E.cuniculi exposure and/or infection. When a rabbit becomes infected, the spores travel to target organs, most commonly the liver, kidney, brain, eye, lungs and heart. Some spores remain dormant for years before causing organ damage, while others multiply and expand within days of infection causing an inflammatory reaction in the surrounding tissue that leads to damage of the infected organ. Depending on the severity of the infection, we will see a wide array of dramatic and potentially life threatening clinical signs. Acute E. cuniculi symptoms most often occur at times of stress or suppression of the immune system due to other disease processes such as old age or respiratory infection. Treating rabbits for E. cuniculi who are already sick, is often not as effective as when we are able to treat them when they are young and “healthy”. Diagnosing and then treating rabbits before they become sick has been shown to improve long term survival and lessen the chances of the insidious outcomes that E. cuniculi can bring about. Because of the severe and potentially life threatening signs, we recommend testing of all new rabbits for E.cuniculi. Why don't we just treat all rabbits preventatively for E. cuniculi? The treatment for E. cuniculi has been shown in rare cases to cause bone marrow suppression, especially when given at improper doses. Treating animals for diseases they do not have is not considered safe and is not up to the standard of medicine we practice here at the Center. 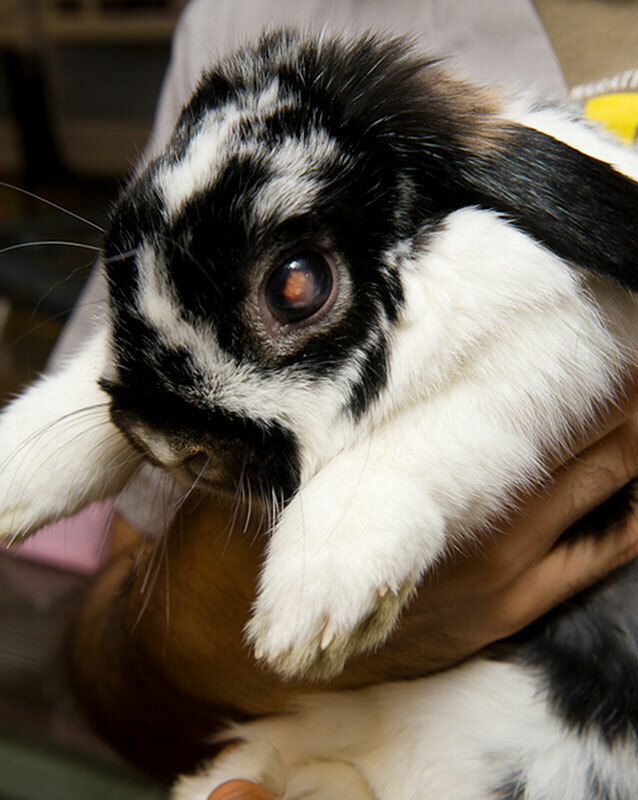 If a rabbit shows any abnormal clinical signs while being treated for E. cuniculi, we recommend bringing them in for our vets to examine and perform testing to make that such a rare reaction has not occurred. What are the signs of E. cuniculi? When the brain is affected, rabbits can develop head tilts, rolling, and inability to ambulate. These signs are similar to signs seen with inner ear infections or other diseases of the central nervous system. When the kidneys are affected we see signs of kidney failure: elevated kidney values, weight loss, and increased thirst/ urination. When the eye is affected, within the lens we can see a white opacity (phacoclastic uveitis) causing near total blindness and potentially leading to glaucoma. One of my bunnies has E. cuniculi, does that mean my other bunny is infected too? It is likely that a partner bunny will be exposed to the parasite. E. cuniculi spores are spread in the urine at their highest levels between 30-120 days post infection. My rabbit suddenly has a head tilt, what does this mean? 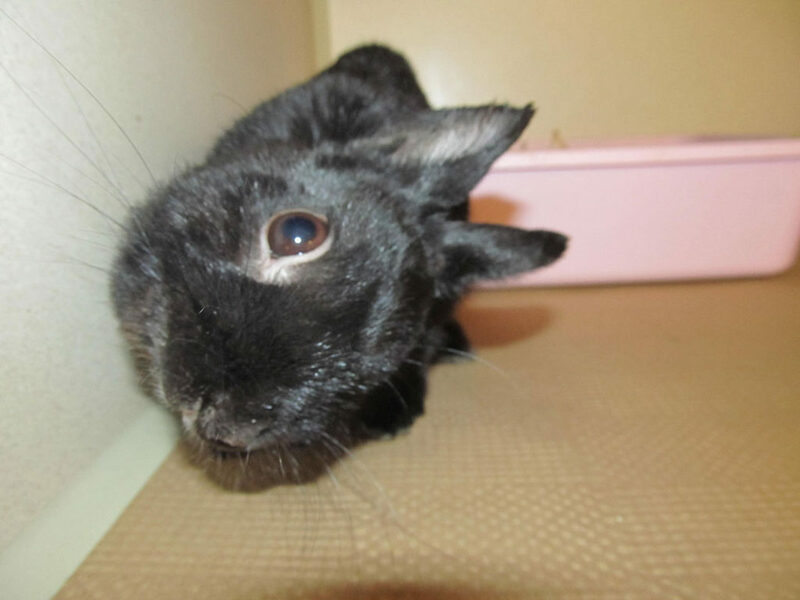 Though E. cuniculi is often the culprit for head tilt signs in rabbits, head tilts can also be caused by deep inner ear infections and other disease of the central nervous system such as bacterial infection, stroke, or even cancer. For this reason, a through physical exam is always necessary before starting treatment. How do you test for E. cuniculi? A blood sample is taken and sent to a laboratory to measure the immunoglobulin levels. Results take between 4-7 days. High IgG levels indicate a chronic infection, rising at 4 weeks post infection. IgM antibodies increase in the first 1-4 weeks post infection, indicating a recent/active E. cuniculi infection. Why should I test my bunny for E. cuniculi if they are not showing any signs? “Healthy” rabbits are still at high risk of carrying the parasite which may develop during times of stress and, as previously described, preventative treatment is far more effective than treating a sick rabbit. Treatment for E. cuniculi requires daily oral medication for 28 days that most rabbits gladly accept. For those instances where a rabbit has concurrent medical problems, such as a head tilt, kidney failure, or anorexia, secondary medications will be prescribed. E. cuniculi also has zoonotic (able to be transmitted from animal to humans) potential, particularly in people that are significantly immunocompromised such as transplant recipients, those infected with HIV, children, and the elderly. While this is extremely rare, it is important that families are aware of this possibility.